The following excerpts are taken from a long-form review of Bowlaway and interview with Elizabeth McCracken, both of which ran in the October 24th, 2018 issue of Shelf Awareness' Maximum Shelf. Bowlaway is on sale now wherever books are sold (and was one of the best books I had the pleasure of reading and reviewing in 2018). Excerpts reprinted here with permission. It can be hard, in a world with so very many books, to find something truly unique to write about. 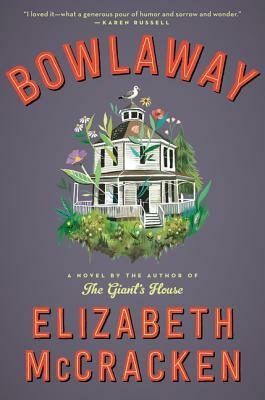 But Elizabeth McCracken (Thunderstruck, An Exact Replica of a Figment of My Imagination) has done just that in Bowlaway, a sweeping family saga centered on a bowling alley. And not just any old bowling alley, but a candlepin bowling alley, and not just any old story, but a love story. "Our subject is love," writes McCracken early in the novel, "because our subject is bowling. Candlepin bowling. This is New England, and even the violence is cunning and subtle." This sets the tone for the rest of the tale, which is itself cunning and subtle, a carefully woven and darkly humorous account of one woman, Bertha Truitt, and the strange and lasting legacy of her fascinating and too-short life.At the turn of the 20th century, in an imaginary New England town, Bertha Truitt arrives. She is not born--a woman like Bertha Truitt is, after all, too unusual to arrive in such a normal manner. No, she just arrives--fully formed and very much alive, on the cold cemetery ground, "as though she'd dropped from the sky." Bertha's arrival sets off a chain of events as inexplicable as her appearance in the graveyard: she founds a candlepin bowling alley, claiming to have invented the sport. She appears in the dreams of her neighbors, whispering, "I have a game for you" and "it is possible to bowl away trouble." And, perhaps most importantly, she insists on allowing women to bowl in her alley, despite the protestations of the men in town. "Well... I invented the game, so I suppose I make the rules," says Bertha to those who challenge her. And though it is unclear whether or not Bertha did, indeed, invent the game of candlepin bowling (or whether the truth of that fact matters), there is no doubt that she makes the rules: for her bowling alley, true, but also for her life. She is a woman who refuses to bend to expectations, instead crafting a life for herself out of what she wants. This is not to suggest that Bertha is perfect; on the contrary, she's incredibly flawed. She believes in phrenology and insists on living in an octagonal house and invents her own definitions for Latin words. She's only one of many perfectly imperfect characters scattered across the pages of Bowlaway, which starts with Bertha Truitt's extraordinary story and continues through generations of her family tree to nearly the present day. As Bowlaway unfolds, the novel becomes many things: it is the story of an incredible and awesome woman and also the story of her legacy. It is the story of candlepin bowling, and the ways the sport mirrors life (or perhaps vice versa). It's a little bit whimsical and a little bit absurd and a little bit funny and a little bit sad. It is about grief and family and life and womanhood and the roles we play in our lives--whether we want to or not. Let's start with candlepin bowling, which features heavily in Bowlaway. It's a rather unique topic on which to center a book. I'm going to go out on a limb and say it's maybe the first novel about candlepin bowling. My nightmare is that I'll write a book and then it will turn out someone else had a similar idea, but I was pretty sure that there was a niche here that I could fill. And I grew up on candlepin bowling leagues. I was terrible--terrible!--at it, but I really loved it. All of the New Englanders I know who candlepin bowl have this total perverse attachment to it. We like to say "Oh no, candlepin bowling is real bowling." In 10-pin bowling, the goal is perfection, and it's obtainable. There are people who bowl perfect games. But I love the fact that in candlepin bowling no one has ever done it. Bowling threads through the entirety of the novel, along with the family line and legacy of Bertha Truitt. Could you talk about your take on this novel as a genealogy, an idea referenced in more than one place in the text itself? My grandfather was actually a genealogist. He did all of the genealogy of his family--my family. I have those, written up; my aunt gave them to me when I got married. I was reading these genealogies, and I was interested in how a story that would be boring about anybody else's family becomes interesting when it's connected to you. The genesis of this book actually had a lot more to do with genealogy than was in it eventually, but I really liked the idea of people being fascinated by who they are related to, even if it turns out they are entirely wrong about it. It's a narrative whose total plot is the netting. That's it. Everything is tied together, but it's only tied together because of offspring. Bowlaway does pack in a lot of seemingly unrelated detail, without a thing feeling out of place. There is more of that than usual here, especially compared to my last two novels, which also took place over a number of years. Those were both somewhat more organized, and they're both first-person narrators, so there's that sort of true line of somebody telling the story to you. This one is a little bit more all over the place. I always wanted to write about spontaneous combustion so, here it is! I'm putting it in! To a large extent, I wrote everything I wanted in the first draft. And then when I was working on the second draft, I had to figure out how to give it shape.